Though Klout has encouraged a wave of complaints having changed its scoring system. We look at the social media start-ups change to its algorithms and consider what is changed and why Klout is suffering a firebrand of complaints in the wake of its shakeup. Well to be straight to the point – Klout’s changes have meant that many have suffered lower scores and anything that takes points, status or power away from people, whether virtual or otherwise is destined to receive complaints. This is not the only issue for Klout, it has also been at the end of a number of blogs, citing it as a meaningless tech start-up jumping on the bandwagon and is really a virtual teacher’s star chart or a social media astrology chart. This is not true, Klout has a huge amount of social media marketing potential and these is a lot of value from having a high Klout score for many, otherwise Google, Facebook and Twitter wouldn’t be investing millions of pounds into creating their own algorithms or keeping an eye on Klout with such ferocity. The changes fundamentally revolved around the inclusion of Google+ and WordPress to the Klout metric, alongside the already established Facebook and Twitter scores. These additions and changes to algorithm calculation did see some people’s points increase, however others also fell hence the complaints. A healthy Klout score is mid 40, with Justin Bieber, the highest influencer in the world with a score of 100 – perfect. 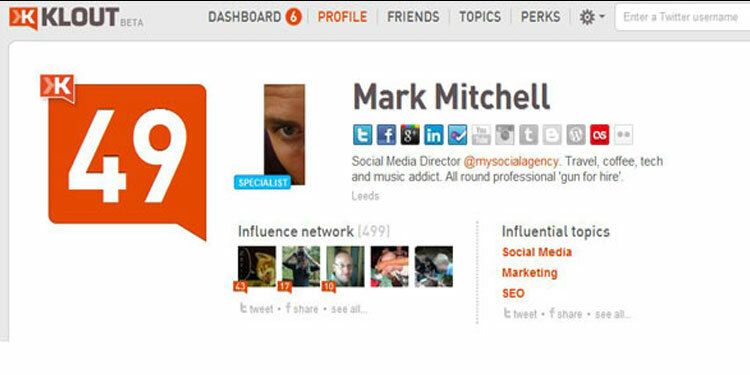 However, anyone with a mid 40- mid 50 score is technically half as influential as Bieber – hard to imagine that two social media agency consultant’s from Wolverhampton living in a semi-d with a combined Klout score of 104 would have the same or more influence as Bieber when combined. •Klout is not 100% accurate, it doesn’t look into how much influence a person has – each person is active on social media for different reasons, some to make money, others to increase their sociability – Klout doesn’t know the difference between either. •’Transparency’ is a word used by politicians and doesn’t offer a clear insight into changes and so once again we’ll have to wait and see how changes and developments take place. •It’s only a ranking and even if it does offer some marketing significance, think of all the interaction, people you’ve met and fun you’ve had – some solace we should hope. One of the rumours bounding around after these unpopular social media changes is that Klout is looking to raise $30m in order to receive a $200m valuation. Whatever the reasons for the changes, we’ll have to wait and see the full effect on user figures and long term effect on Klout scores. How have the changes affected you? Generally negative at My Social Agency although not as bad as some of our competitors 😉 Also, our Social Director Mark Mitchell, got a big rise in score!